The QU+ ONE 4k may be very small, yet it has enough power to play films in the highest resolution. A flat and sufficient CPU-memory that is installed is necessary to make this possible. The Quad Core Cortex-A53 CPU with 2.0 GHz 10bits 4K 60fps HDR10, Mali-450P2 GPU, 1 GB DDR3-memory and 8 GB NAND-Flash-memory make sure that everything runs smoothly. 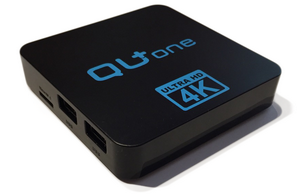 The QU+ ONE 4K supports H.265 High Efficiency Video Encoding (HEVC). With the 4K HDR & 3D Android Smart TV Media Player you can enjoy thousands of exciting Apps, games, perfect picture quality for HDR with 10 Bit colour depth, ULTRA HD & 3D Full HD films as well as pictures, music and audio sound for true cinematic atmosphere. You can all this directly play back from your external hard drive, external USB storage media or from your own network on TV. One of the leading Amlogic chip sets has been installed to make a smooth playback with 60 images per second (60fps) possible. 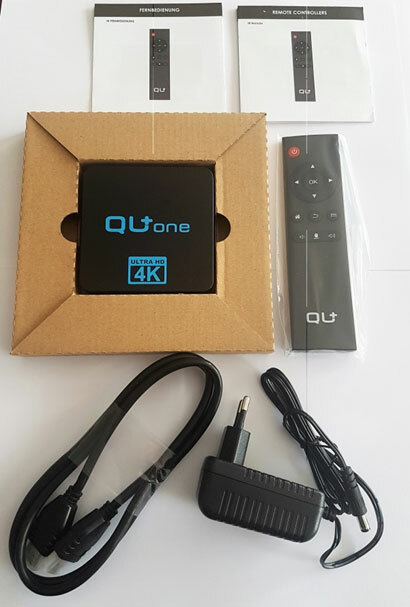 Furthermore, the QU+ ONE has a HDMI 2.0 IN and HDMI OUT (looping in standby) connection and efficient WLAN antenna with 2,4GHz. KODI is often inserted in digital media centers or mediahubs and is supported by many independent and voluntary developers over the world. The QU+ ONE appeals with providing a platform with an enormous selection of entertainment offers and a completely new television experience. Qu + One is the dual boot Media Player that comes with the Android operating system 6.01. An upgrade to Android 7.0 will be provided and can be downloaded from the website. Alternative operating system is Open Source Linux with codes that can be downloaded from the website. It contains special additives (plug-in) for Stalker and similar IPTV services. Processor: CPU 32Bit AML S905X Quad Core A53 processor is an advanced application designed for OTT / IP set top box(STB) and the top of the media applications. A subsystem integrates powerful CPU / GPU, secured 4K video CODEC engine and the best HDR image processor with all the major peripheral devices. If you are looking for ทางเข้า gclub then learn more .